[products] New/Updated price placeholders: [[+price]] now has current (regular or sale) price, [[+regular_price]] has normal price, [[+rendered_price]] contains HTML with the current and (if set) normal price, [[+price_valid_until]] contains a unix timestamp for when the sale price expires. Instead of the old "Price", products now have powerful per-currency "Pricing" with a "Regular Price" and additional "Price Types" that enables time-based sale prices, quantity discounts, and custom price types. The new pricing is supported on the Product Matrix TV, Product List TV, product bundles, and standard products. The cart and checkout now check the price is still accurate each time the item is calculated, making sure the right price is always charged. Enable additional currencies via Configuration > Currencies to e.
Enable the different price types via Configuration > Modules; search for Price. If you have a Custom Product, check out the pricing developer documentation to learn more about how your custom product type can interact with these new features, and what functionality has been deprecated. Anywhere products are available, you can now use `pricing_regular` and `pricing_regular_formatted` placeholders for the regular price in the current (based on context) currency. These will in most cases replace `price` and `price_formatted` respectively. Products shown in the dashboard (e.g. Products tab, Matrix/List TV) will now show the regular price in the current currency, or the regular prices of each configured currency. [discounts] You can now automatically give away free products based on order totals. Enable the Free Products module and navigate to Discounts to use it. [security] All grid values are now automatically htmlencoded to protect against XSS vulnerabilities. Pricing. The new pricing will require you to update templates. GridWidgets now automatically htmlencode all values shown in a grid. To prevent this, add a `'raw' => true` to your array column definition, and use `$this->encode($value)` to manually encode all user input. commerceguys/intl updated from v0.7.4 to v1.0.2 - note: breaking changes. Country information was moved to commerceguys/addressing. comOrder.log() has a new parameter $actionBy. Any derivative order types that override the log method will need to update the method signature. [products] When using the matrix, it will now identify when the resource was duplicated and offer to start with an empty matrix/copy the products/move the products. [taxes] Fix EU VAT Rate Provider using the incorrect country code for the United Kingdom. Previously used "UK", now the proper "GB" per ISO-3166. If you relied on the incorrect behavior, you may need to tweak your tax rules. Please see https://docs.modmore.com/en/Commerce/v1/Upgrades/v0.12.html for optional manual upgrades in 0.12. [addresses] Refactored comAddress/comOrderAddress. comOrderAddress now contains a full, independent copy of the address for the order. comAddress is for the "address book" functionality. Some refactoring to addresses may lead to breaking changes in modules. Where methods like comOrder->getBillingAddress would previously return a comAddress instance, those now return a comOrderAddress instance instead. The same fields (except user and remember) are still available on the new objects, but type checking may no longer work as expected. [core] Add new comSimpleObject::$visibleType to allow derivatives to indicate they should not be shown in ClassFields. If its value is set to a hidden type, the ClassField will be hidden. [cart] Fix potentially incorrect shipping method being shown in the cart on first view after adding a product. [core] The current context and resource (if available) can now be accessed via $commerce->wctx, should also fix any context-specific overrides. [core] comOrderItem now has a tax_group field, automatically set from the product, and getTaxGroup() method to load the instance. Non-product-items can now also have a tax group and taxes applied to it. [dashboard] Dashboard now supports dynamically-generated tabs in forms, the products form has been updated to use this new feature. [shipments] Custom order shipments, defined by delivery type, are now supported. UserGroupShipment available separately. [dashboard] Fix transaction property with a boolean false value being shown as "yes"
loadRequirement methods of custom step classes with the standard ones. These changes have limited impact on templates. Some slight changes were made to the frontend/checkout/cart/items.twig template to show the primary image. Some template changes are included in this release that you may want to apply to your own templates as well. Please see https://docs.modmore.com/en/Commerce/v1/Upgrades/v0.11.html for detailed changes. [stock] Refactored EnforceStock module. Now also monitors for stock changes while customer moves through checkout. The AdapterInterface defines a new parseMODXTags method that needs to be implemented in custom adapters. Prevent potential information disclosure. Full disclosure to follow on February 12th. [dashboard] Order messages grid no longer triggers an E_NOTICE on non-existent index "name"
[core] comOrderItem now has a delivery_type field. [addresses] The comAddress->Order relation was incorrect, and has been replaced with a correct comAddress->Orders relation. For the new previous address feature, the frontend/checkout/address.twig template has changed a fair bit. Please double check your implementation if you use the default templates with custom CSS. The same address.twig template has also been broken up into more partials, to allow more selective template overrides. This includes billing-address-fields.twig and shipping-address-fields.twig templates. Input elements in the address step now have a height and display: block; set in the default CSS and no more margin. The fieldset was changed into a div, legends were replaced with a heading. Two methods of modmore\Commerce\Frontend\Steps\Shipping have been moved to comOrder. These are getShipments() and getItemsByDeliveryType(). A deprecated method that passes it through to the comOrder has been added on the Shipping class, which will be removed before 1.0. If you have a custom Shipping step class that calls these methods, please update those. The Address class was changed a fair bit, as did its default template. If you use a custom child class, please double check your implementation. All EVENT_ related constants have been moved from model and other classes, onto the main Commerce service. The old constants are deprecated and planned to be removed in 1.0. Check your modules to make sure all event listeners are applied to \Commerce:EVENT_ classes. [snippets] Make sure all snippets halt execution if commerce.mode is set to disabled. The templates for the checkout has seen various changes that will need to be updated in your own themes. 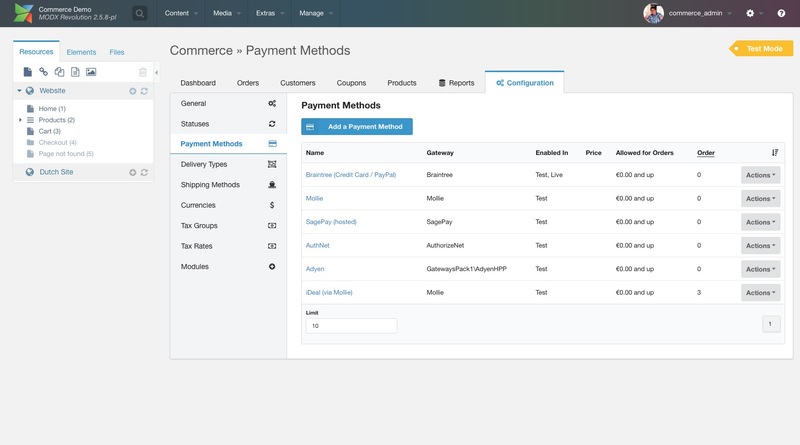 Most importantly the shipping step (frontend/checkout/shipping-method.twig) is very different due to the introduction of Delivery Types and Shipments (see https://docs.modmore.com/en/Commerce/v1/Delivery_Types.html), and the sidebar summary (frontend/checkout/partial/summary.twig) has also seen similar changes. Shipping method classes should start implementing getPriceForShipment/isAvailableForShipment methods instead of getPrice/isAvailableForOrder. There's some level of backwards compatibility for now, but the previous getPrice/isAvailableForOrder methods will be removed before v1.0. The 0.7 approach to setting a checkoutClass on the checkout snippet has been replaced with a setting. Various Checkout classes (NoAccount, RequiresAccount, OnePage) have been marked as deprecated and will be removed before v1.0. Use the settings to control the Standard process instead. the resourceproduct.price_field_decimals system setting to restore the old behaviour of expecting a number in cents. [checkout] Only handle cart update or remove item from cart per POST. [taxes] Completely rebuilt taxes system based on Tax Groups, Tax Rules and Rate Providers. See documentation. [checkout] Add UserProfileAddress module that prefills the customer address from a user profile, and can update profile as well. Taxes have been completely refactored; you will need to reconfigure them. comProduct received a new method: getWeight which returns a PhpUnitsOfMeasure\PhysicalQuantity\Mass instance. comProduct received 2 new methods: getStock, updateStock. First packaged release of Commerce. Below you will see a subset of known issues in Commerce. If you have any bug reports or feature requests, let us know.